We might be one step closer to getting to see Vaan’s emaciated, whiny abs in glorious HD. 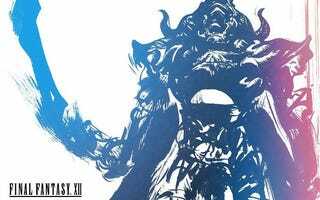 At a Final Fantasy Distant Worlds concert in Pittsburgh Saturday night, composer Arnie Roth randomly announced that yes, Final Fantasy XII is getting a remake, much to fans’ surprise. Hitoshi Sakimoto, who scored FFXII, was also in attendance. It’s abnormal for a composer to be making random announcements like this, so there’s reason to be skeptical, but RPG fans have long predicted that a FFXII remake would be en route after the success of Final Fantasy X HD on PS3, Vita, and PS4. Prediction: Square denies this is true on Monday, then announces it on Wednesday. In response to comments posted by fans, I want to rectify a statement made from the stage Saturday night at our Distant Worlds: music from FINAL FANTASY concert in Pittsburgh. Following conversations with composer Hitoshi Sakimoto regarding new concert arrangements of music from FINAL FANTASY XII, regrettably, the term ‘remake’ was used in error during one of the announcements that took place from the stage during the concert. We sincerely regret any confusion this has caused. Sounds like he really meant to say “remaster”!